Today, September 20th, I received the highest recognition at the presentation of the Guide to “migliori Pizzerie D’Italia” by Gambero Rosso: TRE SPICCHI (three slices) that indicate Italy’s best pizzerias. Broadly speaking, Tre Spicchi were awarded to about 30 pizzerias. 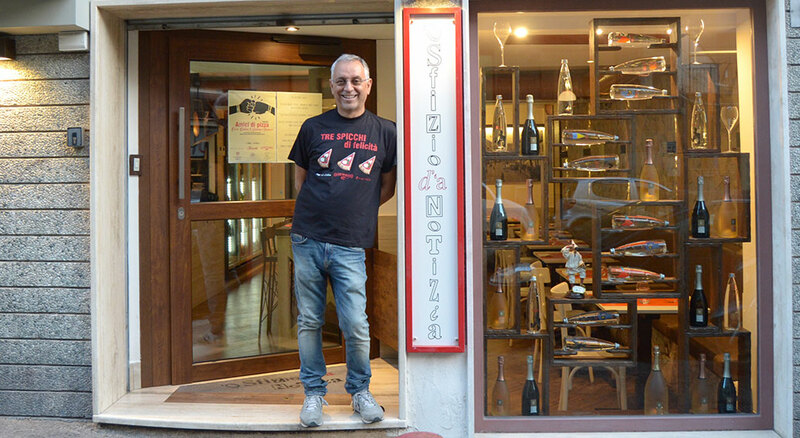 Among these, pizzeria La Notizia 53 and La Notizia 94, while to ‘O Sfizio d’’a Notizia it was given “Tre Rotelle” (three wheels) which refers to the best pizzerias that offer pizza by the slice, even when it is served at the table. Places where the quality of the products (focaccia, traditional pizza, deep-fried pizza) is excellent. Three slices… of happiness, it has been a huge success this year. If I evaluate my pizzerias, they have nothing in common, a part from the street, Via Caravaggio in Naples. Let me explain why: 3 different places, 3 different furnishings, 3 different menus, 3 different wine and beer lists, 3 different dining sets, 3 different team identities, 3 types of customers. I conceived three projects which were developed, little by little, exactly as I wanted it and now I can say that they run independently. With little narcissism, I am proud of all this. My first article on Gambero Rosso magazine, actually it was a short article entitled “tutti pazzi per la pizza” (all crazy for pizza), was published on July 2004, until then the Neapolitan pizza had always been considered subordinate to haute cuisine. Now the excitement for three prizes is identical to that distant quote. The awareness that our work always needs new ideas, goals that seem far away, it doesn’t need predefined economic goals but the will of taking new ways that outline the uncertain as life itself is a great adventure, day after day. Three pizzas can briefly represent the three pizzerias: a margherita, a pizza with broccoli rabes and herring, a deep-fried pizza with zucchini alla scapece and Colonnata lard. As in Franco Ricci Neapolitan song “tre rundinelle napulitane lassano o ciel azzurro e sta città” (three little swallols leave this city’s blue sky) the Three Slices begin their journey telling this story in the real and virtual worlds of pizza. Thank you Gambero which, moving backwards in case of danger or storm, are our travel companion.